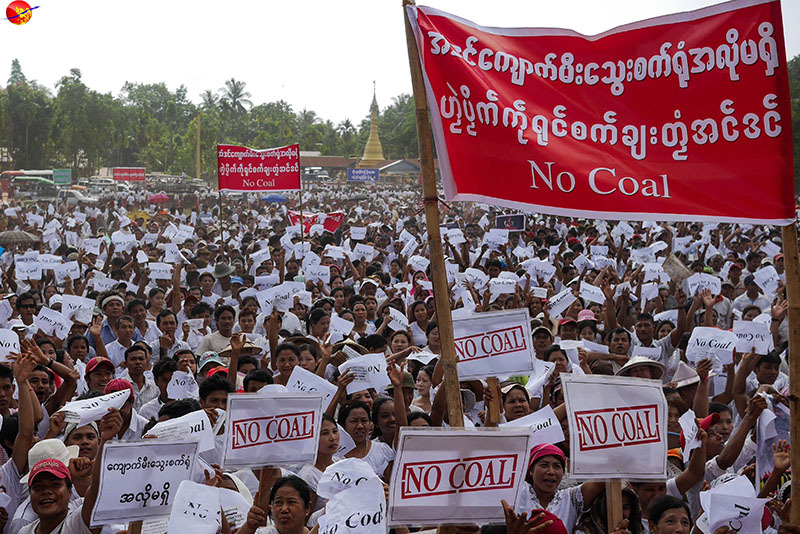 An estimated 5000 people from villages across Ye Township have gathered in Inn Din village to protest the Union government’s plan to build a coal-fired power plant in Mon State. 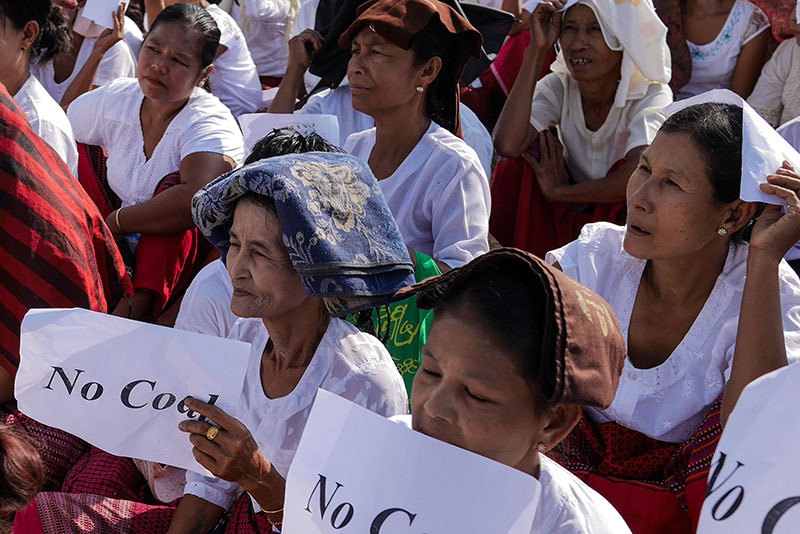 YE, Mon State — An estimated 5000 people from villages across Ye Township gathered in Andin village on Tuesday morning to protest the Union government’s plan to build a coal-fired power plant in Mon State. 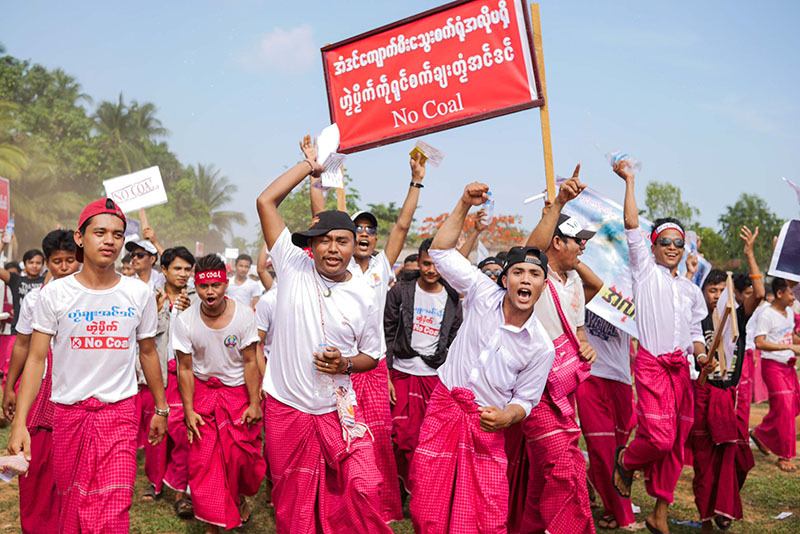 Garbed in traditional longyi and white shirts, demonstrators against the Thai-backed coal plant gathered at a field in the middle of the village, brandishing placards which declared the proposal to be against the wishes of the local population. On Apr. 9, Toyo-Thai Corp. signed a memorandum of agreement with the Ministry of Electric Power’s Department of Hydropower Planning to construct the 1280-megawatt plant with a 30-year operating agreement. The 500 acre project site sits near the beach which abuts the Andin village tract. According to the Toyo-Thai website, construction will begin in 2016 and is expected to take between four and six years, with a total investment of US$2.8 billion. 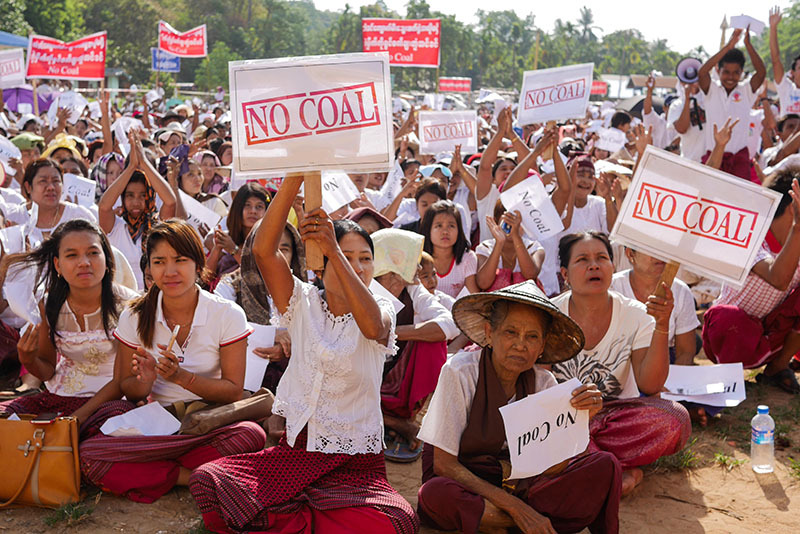 Although the project has continued to move forward since Toyo-Thai signed a memorandum of understanding with the ministry in 2012, locals have been outspoken in their opposition to the coal plant, despite promises to connect homes to the electricity grid from the ministry and compensation offers from the company. Aung Naing Oo, a state parliamentarian, estimated that 90 percent of locals were opposed to the plant after a community consultation last June. 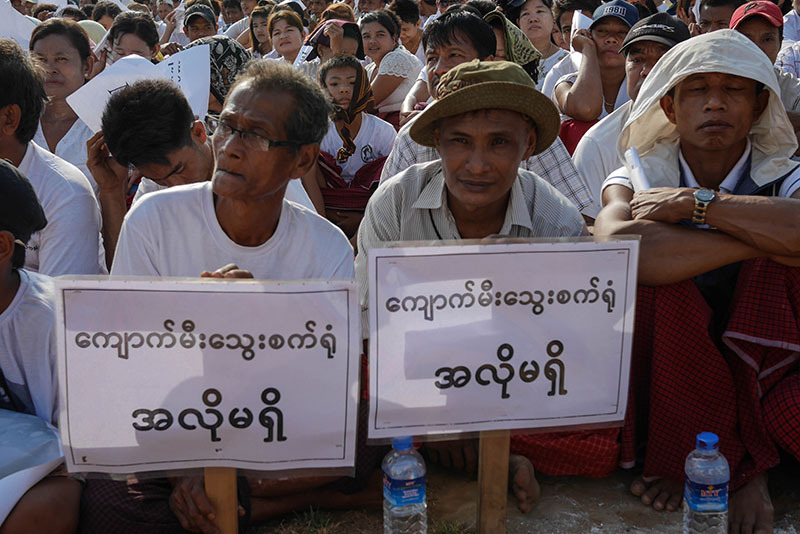 Ni Mar Oo, a 29-year-old villager and member of the Andin Youth Network, told The Irrawaddy at the protest on Tuesday that residents had no trust in the project and had repeatedly complained about the project’s lack of transparency. According to Min Aung Htoo, villagers had become increasingly wary of the proposal after learning about the potential health and environmental risks posed by the project, which had not been presented to the community by either the government or Toyo-Thai. In one meeting, villagers were told that Toyo-Thai would provide a one-time payment of US$1.5 million as part of its corporate social responsibility program in order to promote development in the Andin village tract. Villagers have conducted their own economic survey of the area and claimed the area earns $5.8 million per annum from farming and fishing, which they say renders the Toyo-Thai proposal well below the coal plant’s potential impact on local agriculture. Aye San, deputy director-general of the Department of Hydropower Planning, told The Irrawaddy that the ministry was now finalizing a joint venture agreement with Toyo-Thai, which is in the process of raising funds for investment. The company will be expected to buy the land for the project and will sell electricity to the local market, but Aye San said the ministry would not buy supply from the plant if the company sought prices above what it was able to pay for. Denying that the ministry and Toyo-Thai had not consulted sufficiently with locals, Aye San said that a group of villagers had been taken on a study tour in Japan to learn more about the Ultra Super Critical technology used in the coal plant. Min Aung Htoo, who was also part of the study tour, retorted that the regulatory environment in Japan, construction procedures and standards of government accountability were worlds apart in Japan and Burma. The Human Rights Foundation of Mon Land and the Mon Youth Forum have also condemned the project. 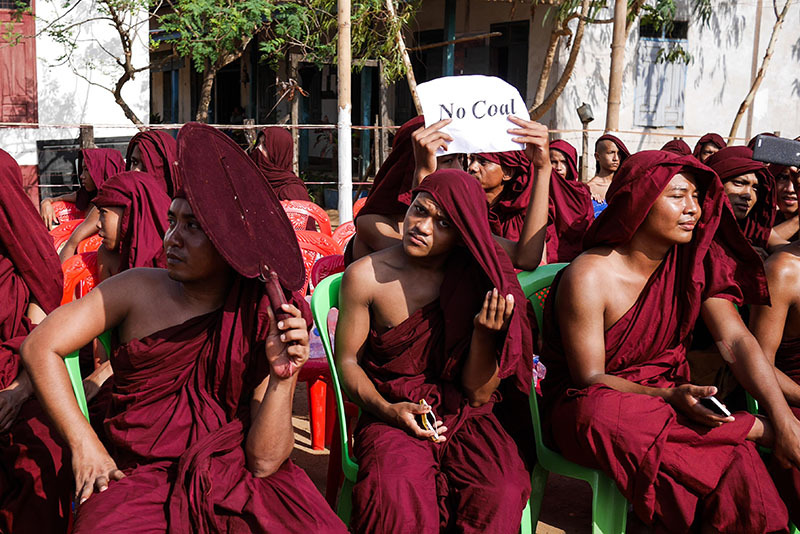 A petition against the coal plant has been sent to President Thein Sein, Union Speaker Than Shwe, the Myanmar Investment Commission, the Ministers of Electric Power and Environmental Conservation, the Mon State government and the Myanmar Human Rights Commission.